The Hay Park trail is located in the Grand Mesa National Forest near Grand Junction, Colorado. The multi-use trail, which is open to ATVs with a width of 50 inches or less, begins off of Forest Road #129 where it travels around Lily Pad Reservoir and the Carbonate Camp Reservoirs before coming to an end at a junction with the Eureka trail. Some maps are calling this the Hay Ride trail but those maps are also showing slightly different routes for the Green Mountain and Eureka trails. 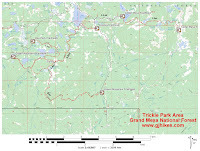 Our GPS files and the map at the end of this post are accurate according to the current routes taken. 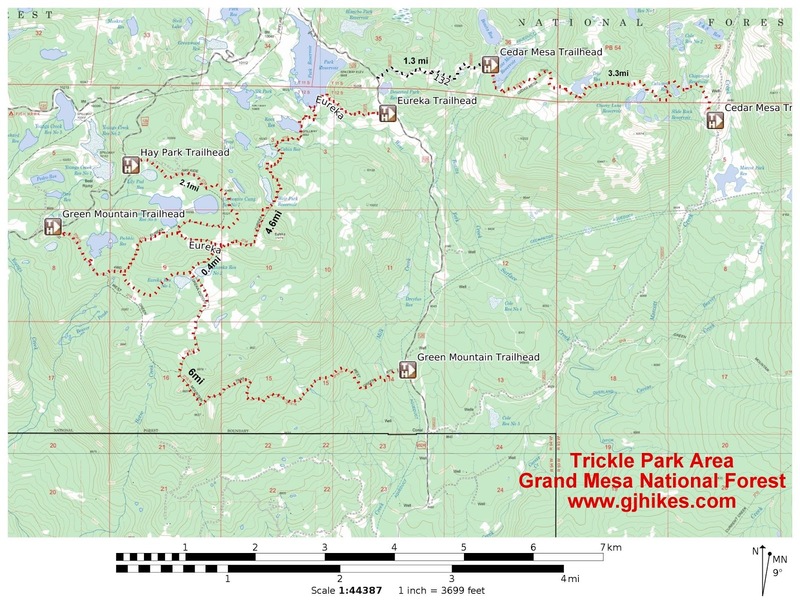 To get to the trailhead follow the Trickle Park Road, FR #121, for 6.2 miles from the Grand Mesa Visitor Center on Highway 65 and turn right onto FR #129. Follow FR #129 for just under 1 mile to the Hay Park trailhead which will be on the left. There is room for several vehicles to park a hundred feet or so from the road. The route passes through a trail squeeze as it starts out that restricts the width of ATVs to 50 inches or less. The scenic Lily Pad Reservoir can be seen off to the right of the trail at this point. There is a slight uphill pitch to the trail as it travels across the side of the mountain where most of the trees are pine and spruce. The trail stays pretty smooth and easy going until it reaches a small hill where it suddenly gets rough for a quarter mile or so before smoothing out once again. In mid summer the temperature starts the morning out in the 40's at this elevation and doesn't start getting to the 60's until the afternoon. As the trail loops around past the Carbonate Camp reservoirs it makes a gradual descent that results in about 100 feet of elevation loss. Right before the trail reaches Forest Road #129 again it turns off of what is now becoming a regular looking road and cuts through the trees. This turnoff isn't currently marked but it is a noticeable well traveled ATV trail. After cutting through the trees the trail quickly meets up with the Eureka trail and comes to an end. A map comes in handy at this point for those that would like to go further. On the day that we were taking the pictures for this post we saw a couple of moose near the junction of the Trickle Park Road and FR #129. They were actually right at the intersection when we first saw them. One of the moose was a cow and the other a young bull that was running around and kicking up its heals. Besides the moose we saw a few deer while we were hiking including one nice looking buck that crossed the trial right in front of us. We hiked the Hay Park trail because it was on the map and we hadn't done it before. We found it to be very nice for hiking and it should also be good to excellent for all other uses. It has all the things going for it that most people go hiking on the Grand Mesa for like wildflowers, the woodsy smell of the forest, cool temperatures and the opportunity to spot some wildlife. For those that are looking for a short hike that is easy to moderate in difficulty and doesn't require anything more than a passenger vehicle to get to it is well worth checking out. If you would like to see it for yourself then all you have to do is 'Take a hike'.